These delicious oat biscuits are natural and tantalizingly crunchy. Made in Scotland by the famous biscuitier Border. Close your eyes and crunch ! These delicious oat biscuits are natural and tantalizingly crunchy. 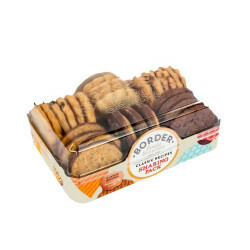 Made in Scotland by the famous biscuitier Border. The box contains 14 cookies. Border is a Scottish family-owned business. The recipes of its biscuits are all original. This company, which celebrated its 30th anniversary in 2014 has been rewarded many times for its products and has participated in the "Biscuit World Cup" in 2003. Only the best ingredients are selected to make these delicious cookies: fresh butter, granulated brown sugar, caramel, quality chocolate and fresh almonds. There is no flavour added (except 100% natural vanilla). 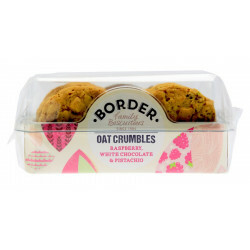 Oat biscuits combined with a tasteful blend of raspberries, white chocolate and pistachio bits, perfect to delight the tastebuds. Ingredients: wheat flour (calcium, iron, niacin, thiamin), sugar, vegetable oil (palm and rapeseed in varying proportions), rolled oats (15%), salt, skimmed milk powder, raising agent (sodium bicarbonate). Allergy advice: contains cereals containing gluten. For allergens see ingredients marked in bold. May also contain eggs, soya, nuts and sesame seeds and barley. Once opened, keep in an airtight container.